CO2 Gas Dryer are used to removing of Moisture in Co2 gas mostly used in food and Braveries Industry. After Installed Co2dryer dew point of (-) 60oC . In this design, the desiccant is regenerated at higher temperature, along with small quantity of dry Co2 Purge. Due to purging with dry Co2 and thermal regeneration, residual moisture loading on desiccant becomes low and this gives very low dew points. 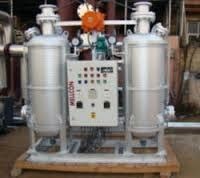 The Co2 drying unit has 2 vessels filled with Molecular sieves desiccant. One vessel remains in drying cycle for 4 hours, while other vessel is simultaneously regenerates at atmospheric pressure. Around 2 to 3% flow of dryer capacity is used as purge for regeneration. Electrical heaters are provided in a central finned stainless steel pipe in both drying vessels. Heating cycle is for 2 hours and in this time hot purge air increases desiccant temperature to around 150 degree c. At this temperature regeneration is complete (due to dry Co2 purge). Dew point achieved is around (-60 ~C) If still lower dew point is required, Co2 purging rate is slightly increased to 5% for (-60 ~C) and to 7.5% for (-80 ~C) Dew point requirements. Filters : A pre-filter provided to remove any physical moisture from Co2 Plant / Co2 tanker before entering Co2 Dryer. A Micron filter is also provided in dryer outlet to arrest any desiccant dust particles, up to 1 micron size. Thus you get absolutely “Clean & dry compressed air. A fully automatics unit requiring no attention of the operator. Heaters switch ON/Off and all valves operate automatically. Pressure is equalized to line pressure before changeover of drying vessels. This prevents pressure and flow surge and desiccant dusting. Desiccant life is around 5 year. Internal heaters provided maximum heat transfer efficiency resulting in lower power requirements. Counter current heated dry purge air provides maximum removal of moisture with minimum gas purge loss.